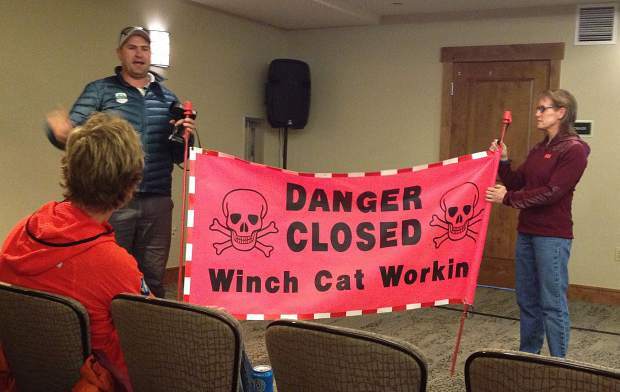 Buttermilk Mountain Manager Travis Benson and Skico Senior Vice President of Mountain Operations Katie Ertl display a banner Monday used at the ski areas to warn uphillers about winch cat operations. The Aspen-area uphilling community is taking advantage of stellar snow conditions on ski slopes this fall but some are leaving common sense behind, Aspen Skiing Co. officials said Monday night. Skico officials held a community meeting at the Limelight Hotel to stress the company will continue to embrace the practice of people traveling uphill at the ski areas but they also urged self-policing and safe practices. Preseason is the biggest challenge for safety because so much is underway on the slopes 24 hours per day, several Skico operations officials stressed to a crowd of about 50 to 75 people. “Right now we’re just jamming all night long,” Aspen Highlands mountain manager Kevin Hagerty said. About 200 people are heading up Aspen Mountain per day while crews are in the thick of snowmaking and snowcat operations. Snowmakers typically have to halt operations to let people by safely. Officials said the biggest danger is running over high voltage electrical wires powering the snow guns, running into hoses for snowmaking guns, venturing too close to snowcats and in the blind spots of operators, traveling at night without headlamps and blinking red lights on the hind end, and traveling in the few established routes right now for workers accessing the mountain via snowmobile. But the biggest uphill sin, Ertl and other stressed, is ascending or descending too close to cats during winch operations, where a cat uses another cat or stationary object as an anchor to groom steep slopes. The high-tension wire rope is difficult to see and can cause severe injury or death if a skier or snowboarder hit it. Crews hang large banners warning about winch cat operations, but it gets overlooked or ignored too often, various officials said. Aspen Mountain snow cat operator Brad Dingess said at the community meeting that five skiers passed the winch cat with tension on the cable Monday, oblivious to the danger. To ensure safety as crews prepare Aspen Mountain for an early opening Saturday, Skico will switch to regular season rules for uphilling Wednesday. Uphill travelers must reach the summit by 9 a.m. and they cannot head up until after 4 p.m. starting Wednesday. 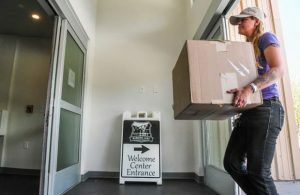 Hagerty said Highlands would prohibit uphill travel on Thunderbowl starting Thursday, when Aspen Valley Ski and Snowboard Club starts training. Once the season gets started, uphillers at Highlands must reach the Merry-Go-Round Restaurant by 9 a.m.
Buttermilk and Snowmass allow uphillers throughout the day. Buttermilk, Aspen Mountain and Aspen Highlands have designated uphill routes. Snowmass is the most flexible. Uphillers are just prohibited from Adams Avenue, a high-traffic route to the base. Buttermilk Mountain manager Travis Benson noted Buttermilk typically undertakes fewer winch cat operations than its sister resorts, so it creates a good option. In addition to posting signs, the ski areas also use a flashing blue light when winch cat operations are underway. “If you see that blue light, if you see the signage, just stay clear,” Benson said. Uphillers at night need to understand that snowcat operators cannot pay attention to their duties and keep an eye out for people at the same time. “They stop on a dime and they go backwards,” Benson warned. An estimated 53 percent of ski resorts throughout the country allow uphill travel, according to the Kottke End Of Season Survey performed for the National Ski Areas Association. Forty-eight percent allow limited access, with restrictions on routes or times, and 5 percent allow unlimited access. Of those that allow access, 56 percent require a ticket of some type, according to the survey. The other 44 percent don’t require a ticket. Skico doesn’t require a ticket but urges people who travel uphill with skins on their skis or split boards or hikers to participate in an “Ascender Accreditation Program.” That voluntary step essentially means reading rules and signing a form. Uphillers can get the form from the ski patrol. One part of Skico’s uphill policy that is still getting ironed out is the dog policy. Dogs are prohibited on Aspen Mountain. They are banned from the other three ski areas during operations. Ertl said must people interpret that to mean while the lifts are spinning, but it’s broader than that. Hagerty said he would like to see dogs prohibited from 7 a.m. to 5 p.m. at Highlands. Ertl said Skico would internally discuss the hours when dogs are prohibited and make an announcement in time for regular ski season. “I’d like to put some thought to it,” she said.